Updates from across Northumberland as high winds and heavy rain battered the region yesterday. 5pm: Since 8am on Friday, Northumberland Fire and Rescue Service has rescued 123 people and evacuated 69 properties with Northumbria Police in the Tyne Valley. Support has also been provided by Tyne and Wear Fire and Rescue Service. Council staff have been busy dealing with incidents keeping roads open across the county, including fallen trees, landslips and surface-water flooding. Council engineers are busy inspecting bridges due to the high surface water. Due to rising water, Ovingham Bridge has been closed and is likely to remain closed for the next few days as a result of scaffolding underneath the pedestrian and road bridges being damaged. The road bridge is open to pedestrians, but is closed to vehicles until engineers can confirm that the bridges are safe once water levels have dropped. Paul Hedley, Deputy Chief Fire Officer with Northumberland Fire and Rescue Service, said: "Agencies have continued to work closely to deal with a number of flooding and wind-related incidents. We have a number of fire and rescue service staff, partner staff and council staff in the communities working hard to deal with the incidents and to reassure residents. We would advise motorists to continue to take care due to the potential of continuing surface water and debris on the roads. We would also urge that members of the public continue to exercise caution and vigilance." 2pm: Our photographer Jane Coltman has taken a short video of the river levels in Morpeth - watch it here. The River Wansbeck is quite high, but the flood gates, part of the town's new defence scheme remained open overnight. The A697 between Wooler and Wooperton has now reopened (see noon entry). 1pm: Police are continuing to support residents in Corbridge and other parts of rural Northumberland affected by floods. Officers will remain in the affected areas this afternoon, helping residents and offering reassurance to those who may be concerned. The A69 has now reopened, but police are urging motorists to drive with care due to standing water and high winds. Superintendent Peter Bent said: "We would like to thank people who have been affected by floods this weekend for their patience and co-operation. We encourage residents to continue speaking with officers who are in the area and ask anyone who has elderly or vulnerable neighbours to check on them and report any concerns straight away. We are monitoring the situation closely and have been plans in place to enable us to respond should the current situation worsen." Meanwhile, a bus driver who assisted after a man was hit by a sign at Berwick railway station yesterday has wished him well in recovery. Noon: A section of the A697 in north Northumberland will be closed for two hours due to an overturned lorry. 10.15am: Motorists are being asked to exercise extreme caution when travelling around the county today. Prolonged rainfall and severe winds have left debris, fallen trees and heavy surface water on roads and although weather conditions are improving, driving conditions remain extremely hazardous. Northumberland County Council’s highways and neighbourhood service teams have been working around the clock to clear roads around the county. David Laux , head of technical services at the county council, said: "Public safety is our main priority. Our teams have been working extremely hard to keep the road networks open, but there is still a lot of standing water and some debris on the road networks. We are advising people not to travel unless they need to and to exercise extreme caution especially on winding, country roads. You never know what could be around the next corner." 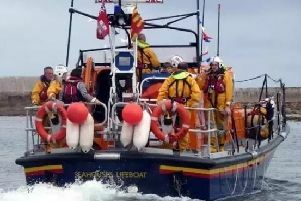 Elsewhere, the cross-Tyne Shields ferry was rescued last night by Tynemouth RNLI lifeboat volunteers in a dramatic mission. 8.30am: Police remain in Hexham to help keep members of the public safe during adverse weather conditions. Officers will remain in the affected areas throughout today and continue to work closely with partners at the Environment Agency and Northumberland County Council to help people who have been affected by flooding. Over the course of yesterday, 73 homes flooded in the Corbridge area and 47 people were evacuated. A rest centre at Priory School, Hexham, was opened to residents. A weather warning is in place again for today for heavy rain. For the latest information on flooding, contact the Floodline on 0345 988 1188. Superintendent Peter Bent said: "We have extra officers in Hexham, Corbridge and other parts of rural Northumberland today to support people who have been affected by yesterday's floods and will remain in these areas throughout today to speak with people and offer reassurance. Due to heavy surface water, driving conditions are expected to remain extremely difficult and we urge motorists not to travel unless absolutely essential. We appreciate people may be concerned about their safety and we urge people to speak with an officer face-to-face or call police on 101. Public safety is our priority and we will continue to work with our partner agencies to offer support to our communities." Road closures currently in place: A69 is currently closed between Greenhead and Hexham. A diversion is in place along the Military Road but it is passible with care although the road conditions have improved within the last hour; Ovingham Bridge, Station Road is closed; Standing water on the A69 at Melkridge is causing traffic delays; The B6231 Bridge in Corbridge is closed to the public due to the rising river level. 11.15pm: Police are continuing to work with partners to help keep members of the public safe during the current weather conditions. Officers are in Northumberland working with the Environment Agency and Northumberland County Council to assist residents who have been affected by flooding. They will remain in the affected areas helping residents and offering reassurance to those who may be concerned and will remain in the area throughout the night. For the latest information on flooding, contact the Floodline on 0345 988 1188. High winds persist across the region making driving conditions difficult. Motorists should not to take risks and only travel if it is absolutely necessary. Superintendent Mick Paterson said: "We’re aware as we move into the night people may be more concerned, however, I'd like to offer my reassurance that public safety is our priority and we will continue to work with our partner agencies to offer support to our communities. We will have officers working right through the night in the areas that have been affected by flooding and would urge anyone who needs help to contact us. We are monitoring the situation closely and have been plans in place to enable us to respond should the current situation worsen. Driving conditions remain difficult across the region due to high winds and I really would urge motorists to only travel if it is absolutely necessary." 9pm: Latest from Northumbria Police - A number of roads are currently affected and there are road closures in place due to flooding. The following roads are affected: A69 is currently closed between Greenhead and Hexham. A diversion is in place along the Military Road but it is only passable with extreme care; Standing water on the A69 at Melkridge is causing traffic delays; The B6231 Bridge in Corbridge is closed to the public due to the rising river level; High-sided vehicles are advised not to use the A69. Hauliers travelling along the A69 will be asked to turn around at Bridge End roundabout. HGVs travelling from the North West are advised not to do so. Superintendent Mick Paterson said: "Public safety is paramount and our absolute priority. Motorists should not to take risks, particularly on minor roads and areas that have suffered flooding - only travel if it is absolutely necessary. The A69 is closed between Greenhead and Hexham and while there is a diversion in place along the Military Road, the road is only passable with care and I would advise people to avoid the area. Any high-sided vehicles planning on using the road are advise not to." For up-to-date flooding information, contact the Floodline 0345 988 1188. Anyone who has concerns about their safety or the safety of another is asked to contact police on 101 or dial 999 in an emergency. 6.30pm: Due to major flooding at Carlisle, all East Coast routes to/from Edinburgh are currently blocked. Planned engineering works have meant that Virgin Trains have been travelling via Carlisle on Saturdays, but this is not possible this evening. 6.15pm: A flood warning (Flooding is expected. Immediate action required) has been issued for the River Tweed at Norham. This means that flooding of homes and businesses is expected. Act now to protect yourself and your property. Flooding is expected for properties and low lying land around the Boat House and the Boat House Cottage. For the other flood warnings in place, see 4.15pm update. Meanwhile, a Lisburn Street, Alnwick, resident is asking her neighbours to be on the look-out for a large, pink, Apple-shaped paddling pool which blew over a six-foot wall and cannot be found. 6pm: Northumberland County Council and partner organisations are continuing to respond to the flooding and wind issues in the county this evening – particularly in the west of Northumberland. The Environment Agency has issued 13 flood warnings and two severe flood warnings for Corbridge. Rain is forcecast to continue for several more hours and river levels including the North and South Tyne are expected to rise for a number of hours. The North Tyne is already at record levels and is predicted to rise by another metre. 49 houses in Corbridge have been evacuated and there are a number of properties flooded in Haltwhistle and Haydon Bridge - where levels continue to rise slowly and are expected to level out in the early hours of tomorrow. A rest centre has been set up in the Priory School in Hexham for affected Corbridge residents. The centre has been established by Northumberland County Council’s civil contingencies team and will be staffed by council housing and civil contingencies staff. At present, there is no flooding expected in Morpeth, but the Environment Agency is monitoring the area closely and they may close the flood gates at High Stanners later today if required. The gates are part of the newly completed Morpeth Flood Defence Scheme.‎The scheme has two parts - flood defences through the town and the upstream reservoir near Mitford. The way the defences operates is that they will allow as much water as possible to pass through the town before the reservoir, which can store in the region of 1.5mllion cubic metres of water. Residents may therefore notice levels rising before the reservoir opens. The river level at Ponteland are also being monitored. The A69 is currently shut at Greenhead in both directions as are a number of minor roads and police are urging people not to travel in the area tonight unless it is absolutely necessary. A69 diversions are in place around the Military Road which is only passable with care. Northumberland Fire and Rescue Service has numerous resources in the west of the county including a swift water rescue team and 4x4 vehicles. In the past 24 hours, it has received 72 emergency calls - way above the daily average. Teams of county council staff have also spent all day working to keep roads open wherever possible.Paul Hedley, Deputy Chief Fire Officer with Northumberland Fire and Rescue Service, said: "Agencies have been working closely throughout the day to deal with a number of flooding and wind-related incidents. This will continue throughout the night and I’d like to thank the communities of Northumberland for their co-operation throughout this difficult time. This has been a challenging time, but it is exactly the sort of event we plan for and well established plans have been put in place to try to minimise disruption. We would repeat police advice not to travel unless absolutely necessary and take great care when out and about." 5.30pm: In Berwick, Asda at Tweedmouth was closed earlier this afternoon. A spokeswoman said: "The store is currently open and trading as normal. It was closed briefly this afternoon while we checked the roof to make sure it was safe, and opened again at 4.30pm once we were satisfied." There are unconfirmed reports that someone was taken to hospital after being hit by a sign at Berwick Station. We are unable to confirm this as Northumbria Police is currently extremely busy and dealing with a number of incidents. 4.15pm: A flood warning (Flooding is expected. Immediate action required) has been issued for the River Rede at at Otterburn, West Woodburn and Redesmouth. Flooding is expected for properties around Otterburn Bridge, Mill House and Brownchesters, in Otterburn. As well as White Acre, The Close, Bridge End, Brae Well Close and Redeside in West Woodburn and Redesmouth Mill in Redesmouth. Rain over the last 12 hours has caused the River Rede to rise. River levels are rising significantly at Otterburn, West Woodburn and Redesmouth, where property flooding can be seen from 6pm. More heavy rain is expected throughout the rest of Saturday overnight into Sunday, so river levels will remain high. Elsewhere, there are no flood warnings outside the west of the county, but there are flood alerts (Flooding is possible. Be prepared) for the Wansbeck, Tweed South Bank, Upper and Lower Coquet. 3.45pm: Northumbria Police: A69 now closed at Acomb with traffic diverted to Military Road in Northumberland. Drivers asked to take extra care. 3pm: The latest weather warnings from the Met Office are amber (the second highest) for both wind and rain in Northumberland. Elsewhere, The A69 is now open again at Haltwhistle. 1.30pm: The A69 Haltwhistle Bypass is currently closed to traffic in both directions due to flooding. There are no diversions in place at this time. Council staff are working to re-open the road as quickly as possible. 1pm: The major issues seem to be mainly in the west of the county. A rest centre has been established for residents whose properties could be affected by flooding in Corbridge and a number of homes have been evacuated. Meanwhile, across the border, more than 1,000 homes in Hawick have been evacuated - read about it here. Train lines have reopened at Newcastle following issues earlier today, but speed restrictions are still in place. Bus replacement services will be operating to and from stations including Berwick, Alnmouth and Morpeth as on previous Saturdays due to planned engineering works. 11am: Northern Powergrid, the company responsible for running the power network across the North East, Yorkshire and northern Lincolnshire, is reporting that it has restored power to around 19,000 customers after Storm Desmond hit the region last night. The storm has caused power cuts for around 23,000 customers, predominantly in Northumberland, County Durham and Tyne and Wear. Engineers have successfully restored customers since the severe weather hit at 7pm last night by diverting electricity supplies, where possible, through alternative routes on its network despite storm force winds making it difficult for engineers to climb and repair the damage caused to overhead power lines by fallen trees and flying debris. Meanwhile, sports fixtures are also being affected by the weather. Alnwick Town, Morpeth Town and Bedlington Terriers are among the teams whose games are off. 10.45am: Northumbria Police has received reports of flooding in parts of Hexham. There is heavy surface water and flooding in the Corbridge area. Motorists are advised to avoid the area until the water subsides. Emergency services and the local authority are responding to the situation and are dealing with the surface water. Superintendent Geoff Logan said: "We are working closely with the other emergency services and partner agencies to plan and respond to flooding. Extra officers are in the area speaking with residents and offering reassurance." Flood warnings are currently in place for the River South Tyne at Haltwhistle, Slaggford and Lambley, and two at Haydon Bridge. There are also two warnings in place for the River Tyne at Corbridge, and at Bywell and Prudhoe, and Ovingham and Low Prudhoe, as well as one for the River Wear at Lower Stanhope and one at Hurworth Place on the River Tees. Rain is expected to continue for the rest of the day, affecting rivers at North and South Tyne, the top of the River Wear and the lower Tees. 10am: Northumberland County Council and Northumberland Fire and Rescue Service are operational across the county dealing with the impact of flooding and potential flooding, and of high winds. Overnight, more than 100 calls were received, the majority related to trees across roads, particularly in the north of the county and the council and fire and rescue staff and equipment were used to clear roads. Currently seven flood warnings and two severe flood warnings are in place and around 300 properties are at risk of flooding, with a number of properties already affected in West Northumberland. There is surface water flooding in a number of parts of the west of the county with areas around the A69 having been particularly affected. Council and fire and rescue resources are supporting incidents of flooding and threatened flooding in these areas. At any one time, six to eight fire appliances have been operational and between 30 and 40 staff, with specialist equipment being used. Local services teams have been dealing with fallen trees and gully wagons have also been working to deal with surface-water flooding. Today, at least 30 local services team staff are already available to deal with incidents, with sand bags prepared and being deployed where needed to locations where there are rising river levels and surface-water flooding. County council and fire service staff will remain vigilant and available to support incidents across the county. 9am: Northumbria Police has urged drivers to take care and only travel if essential. Travel and road disruptions are as follows: The Metro service is currently suspended between Jarrow and South Shields due to damage to power lines; A68 Carter Bar and Redheugh Bridge closed to high-sided vehicles; A697 at Powburn down to one lane with overturned HGV; B6319 Newborough/Hayden road closed due to flooding; Redesmouth to Bellingham closed due to flooding; Debris in road at Shilbottle/A1 slip road; Fulwell Road, Low Road and Ashby Street in Sunderland closed due to fallen debris; A69 at Haltwhistle flooded but passable with extreme care. The public are thanked for their cooperation. There are still issues on the railway at Berwick. Network Rail says engineers are working to resolve the issue. Visit www.nationalrail.co.uk to get timetable updates. There are reports that a barn roof has blown over the road between Shilbottle and the A1 with suggestions that motorists use the Hampeth road instead. Overnight: The B6348 near Wooler was closed in both directions between the B6349 junction and the Weetwood Avenue junction, because of a fallen tree and collapsed power cables, there were no trains between Berwick-upon-Tweed and Edinburgh because of overhead wire damage and there were power cuts in the NE66 and NE71 postcode areas. Meanwhile, Alnwick's Christmas tree in the Market Place was broken and had to come down and be secured in place.